As most of you know I am not fond of many of the spray heads currently offered on batch-brew machines. A good spray head is simply one that wets the coffee bed evenly, without favoring any specific areas too much. The best spray heads to date have all been flat plates of approximately the same diameter as the coffee bed, and with numerous (15+?) holes to spread the water evenly across the bed. Simple, right? Unfortunately, those plates require daily cleaning to prevent scale build up and many machine owners don't bother to do the scheduled cleaning. Clogged spray heads have led to many service calls over the years. Rather than educate users about the need for frequent cleaning, manufacturers decided to design scale-proof spray heads to reduce service calls. These new spray heads don't extract as evenly from the coffee bed, but that didn't prevent manufacturers from marketing the new spray heads as an improvement in extraction quality. The design of the new spray head is typically a small plastic dome shaped a little like an almost-fully-open umbrella. The machine dispenses water at the top of the dome, and the water cascades down the sides. The problem is that the dome directs the water in too few streams, and areas of the coffee bed directly in the path of those streams extract more than other areas do. I did some consulting work for Andy Kyres of Tunnel Espresso in Montreal a couple of years ago. Andy had a Fetco with the new model of spray head and I explained the spray-head problem to Andy. He then decided to build his own. In something of a happy accident, Andy's flat-plate spray head seems to extract a little better than Fetco’s original flat-plate spray head ever did. Andy dubbed his design The Bed Wetter. The BW came from a love of batch filter coffee and also a frustration with batch filter coffee makers. We wanted more uniform extractions from our brew baskets in the form of flat spent coffee beds. The spent beds we were getting from the stock CSD on the Fetco brewers were lumpy and inconsistent, which indicated a lot of channeling. After playing around with design ideas we settled on a flat plate that delivers water more gently and evenly to the entire 5 inch (diameter) coffee bed. 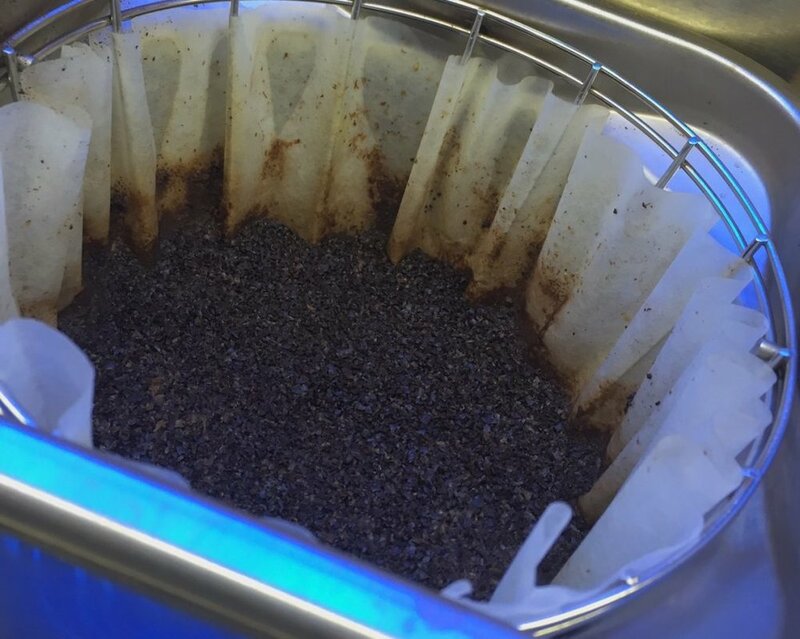 Initial tests showed an improvement in extraction percentage and strength as well as flat coffee beds. These improvements created balanced flavours, consistency, and saved our cafe money in the long run by using less coffee to get our desired strength. I’m writing this blog post as a public service. Although I helped Andy create the product and he offered me a share of sales, Andy has taken the risk and done the work. I’ve decided to forgo any benefit from the project, and just want readers to connect with Andy if they would like to buy a Bed Wetter. Please note: The BW works with the older Fetco series, NOT the XTS machines (you know if you have an XTS because it has the new touchscreen interface.) If there is sufficient demand for the BW for the old-style Fetco, Andy plans to release an XTS-compatible version.